The Search is a 2D action game that can be played with the mouse. Left mouse button only. There is turn-based combat and special abilities to be found. This is excellent progress. You already have the frame for your experience! I'm interested to see what other systems you're able to prototype in a similar manner with the pace you're going at, particularly in the direction of the competition theme. @Nandrew, thanks! I'm a big fan of your work. :) It's a challenging theme this year TBH. With escalation comes balance requirements and that's going to be interesting to say the least :) The progress has been fast cause I'm using scripts from older prototypes for the usual stuff. Also the unity canvas is doing a lot of the heavy lifting for me. No physics in sight. Hey! I gave this a try and noticed that sometimes when I enter the circles it doesn't give me the option to leave. Is this a bug? Also, will the items inside the circles be collectibles? 1) It's sometimes a bit hard to see the icon that comes up when you hover over a planet to enter it. Initially, I didn't know what it meant or what would happen if i clicked on a planet (I didn't want my little ship to blow up and die D: ). 2) Sometimes I will click on a planet to enter it but then it'll say that I can't enter my vessel instead. Well done on making such great progress so quickly :D I think this is going to be super cool! I have completed v1.0 of The Search and it's uploaded with 20 minutes to spare. What a ride It's been, loads of fun and I learnt a lot. I would have liked to add so much more, but it's pencils down unfortunately. Good luck to all you contestants, I cannot wait to play all your submissions. I've updated download page to reflect PC, MAC and Linux as per Unity build screen. Tested only on PC though. I think this must have gone through several iterations already because I didn't experience some of the mechanics mentioned in earlier comments. Were they removed? The narrative at the end was a nice interesting revelation. It made me wish that you could have had more time to flesh out the mechanics/balancing and make the visuals tie in with the premise. A small bug... the incoming fire from enemies didn't draw correctly (from source to target). It looked like the player character was doing all the shooting. Turned based games are kinda tough and I wonder if it might have been more interesting as a real time shooter? In any event, it was fun and curious to see what comes next and kept me going. Kudos on keeping the player engaged. @Pierre Which mechanics mentioned in comments are you referring to that might have been removed? It is very unbalanced as you can 1 shot everything currently, so the turn based action doesn't really shine as intended. The enemies need more health and damage so that the power-ups become useful. I just ran out of time. "Also, will the items inside the circles be collectibles?" - I didn't see any items inside the circles, or were those the pickups after the fight?
" it'll say that I can't enter my vessel instead. " - was there a time when you could go outside your vessel? I hear you, about time. There was so much I still wanted to add myself, but I didn't want to try and squeeze things in a rush, so at about 11:30 am on Sunday, I decided to start wrapping up the game loop. Start, Stop, Game Over etc. On the one hand, I have some regret, that I didn't add more. I didn't see any items inside the circles, or were those the pickups after the fight? Yes, the items inside the circles being referred to are the pickups after the fight. The earlier iteration has them scattered around as I was testing the hotbar and pickup mechanics. Aaah, I forgot about that. You could click on the vessel and a message popped up. I removed it because clicking on the vessel interfered with the players ability to click on a circle when the vessel was over the circle and it didn't add any value anyway. Nice music, gameplay, narrative combo! Your choice of music for the game felt very spot on. Also it must have been difficult to try and balance that kind of game-play. As far as I could tell the progression came from collecting power ups, which was a result of fighting well with your current power ups. So the players attention isn't directed to trying to do something specific other than win to ensure that progression happens. In crashlands you need to collect specific resources to get specific power ups. Maybe if destroying the ships gave you power ups and there were a limited amount of rounds, then the player would have to choose who to shoot, to both stay alive and get the best power ups for their choice in escalating their possibilities. Though I don't know whether that would even be necessary. 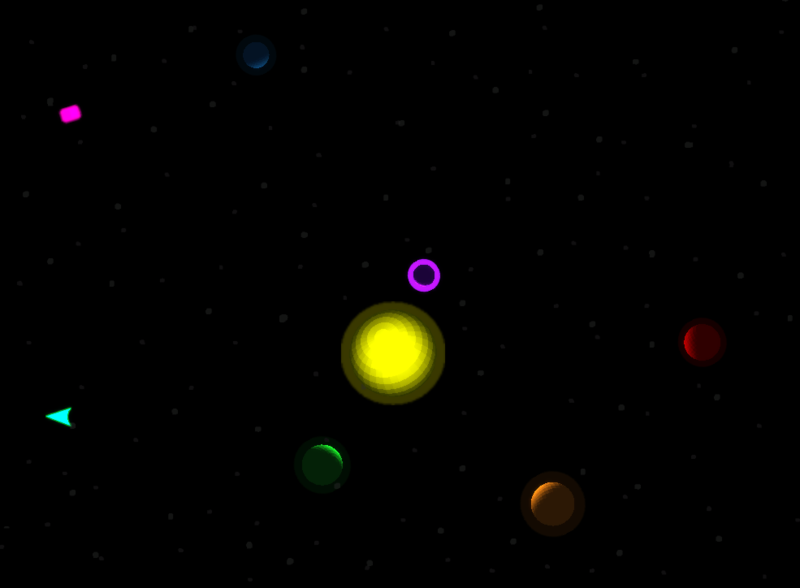 Also, cool star/asteroid/background effect, its so simple but I love the feeling it gives. Special abilities not factored in. I was pretty confused by what was happening during combat. I sort of figured it out after a while, but a lot of the miscommunication was in where the line renderer was drawing. I enjoyed the audio; I think the music made a pretty big difference. I can see this being pretty darn compelling, wondering between portals/encounters, outsmarting enemies, and unlocking more pathways and more abilities, and more snippets of story, and I think it's so impressive to me that you could evoke that kind of imagination with the jam time limits that you had. This is something I'd definitely want to play again with more polish on the UI, balance and feedback on what's happening! Congrats! Thanks @Elyaradine for taking the time to review my game. "You only get one shot, do not miss your chance to blow"
What was great about this jam personally was feeling inspired enough to carry on working on the game afterwards, as many others seem to have done as well. That's a good thing for MGSA and the SA Game Jam. It's a rad little game. Managed to get to the end on the first run, but I felt like I nearly got killed at least twice (by myself planning a bit poorly). So it felt very well balanced for an enjoyable, edge of the seat, experience to me. What I would have really loved in this sort of game would have been some choices as to what powerups to take or which planets to go to in which order. Combat got more and more interesting as it went on, but I would have loved for the abilities in combat to be tied to decisions I had made in some way. I would have played again if different runs produced different results and I could experiment with powerful combinations of abilities. You've got the basis here of a game a little bit like Slay the Spire, and I (and a ton of other people) really enjoy the experience of playing Slay the Spire. 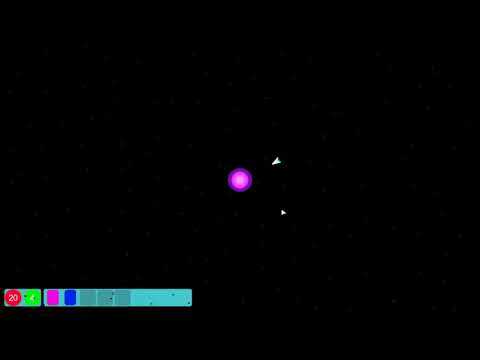 A little more feedback on the shooting (as other's have mentioned) would have been nice, but by the time the combat was challenging me I had worked out the order that enemies fire in and how the abilities system worked. I definitely got a sense of escalation here! It was a little weird reading the text at the end of each combat about "possibilities escalating", which might have been a bit too on the nose for me, but the numbers and abilities definitely were increasing in quantity and complexity. Looks good. The lasers are easier to follow now for sure. Was one of those tweaks that the Smart Bomb only deals 50% damage? That seems like a (smart) decision that will open up a bit more strategy. Thanks @EvanGreenwood, the update is mostly to make the prototype a little bit more presentable while learning a new tool as well (Blender). I think the game lacks player choice/strategy currently, but is a start to experiment with and understand scale and balance a bit better. backtrack then push forward with new knowledge learned. I think playing more board games is key to learning that skill. At best I can use this as a balance tester in the future.